Tourists seeking the healing baths in Hot Springs, Ark. have often sought other entertainment as well — much of it illegal, from gambling to prostitution and liquor. 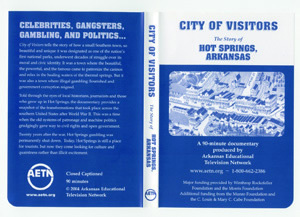 Fascinated by the evolution of this colorful city, University of Arkansas journalism professor Dale Carpenter produced “City of Visitors,” a documentary that follows the political history of Hot Springs as well as the difficult choices the townspeople make as they struggle to reconcile moral issues with the increasing wealth such entertainment produces. Carpenter discovered that the town’s citizens were constantly dealing with the question of how openly the illegal forms of entertainment should be allowed to operate. Over the years, the city hosted illustrious and notorious visitors alike from around the world, such as Al Capone, Wyatt Earp, President Herbert Hoover, Bonnie and Clyde, Babe Ruth and Helen Keller. Gangsters from New York, Chicago and Detroit would flee to Hot Springs for sanctuary, protected from prosecution by the local authorities. Federal laws passed in the 1960s forced the state to close illegal gambling for good. The state legislature passed a bill to legalize gambling, but Gov. Winthrop Rockefeller vetoed it. Since becoming legal in 1933, Oaklawn racetrack is the only remaining outlet for gambling in Hot Springs.